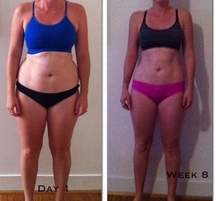 Prior to joining the Busy Mums 8 Week program I was not feeling comfortable with how my body was feeling. I had been looking for something new to motivate me again when I stumbled across Busy Mums – I umm’ed and ahh’ed about filling in the form but just went for it. Over the past few years I had gone through phases of fitness and weight loss either trying on my own or through another online program but after a few weeks I would fall back into old habits consistently of eating badly and lacking in motivation, feeling tired (but not lack of sleep tired) and gaining the weight I had lost. I am now making better food choices and getting my workouts done otherwise I have a feeling of being incomplete. Within the first week of this program, when I noticed someone across the room at work yawn, I realised I wasn’t feeling tired in the afternoons anymore, I realised I had stopped yawning. After 8 weeks I am now back on track and feeling motivated. I believe wanting to change starts with your mindset and this program helps with just that. Just take the leap and trust in this program, you will get results. The first week or two may be hard but it gets easier – so much so that I got to the point of not having to think twice about what to eat. I have enjoyed the support from the Busy Mum team and the knowledge they have – not just food and exercise but the mental as well (although I still have this to work on). The check in phone calls every couple of weeks was great too. The meal plans are great – they are simple and are normal everyday foods, nothing fancy. The workouts are easy to follow and a great format too.